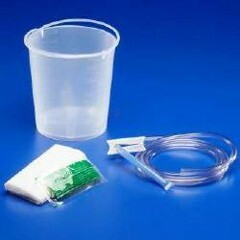 Enema Bucket includes 1500 cc plastic enema bucket, tubing, packet of Castile soap, dropsheet. Don't forget to buy a connector, which will connect your catheter to the tubing coming from your enema bucket to prevent leaks. 3 Catheter-1 Connector Combo........SAVE 25%!